If you’ve been keeping an eye on sports this season you may have seen the new ESPN NBA promo campaign NBA Saturday Primetime on ABC with some familiar microphones. Ear Trumpet Labs’ Myrtle model is featured both visually in the campaign as well as the source of the audio for the vocals recorded for the spots, proving yet again that Ear Trumpet Labs microphones look just as good as they sound. 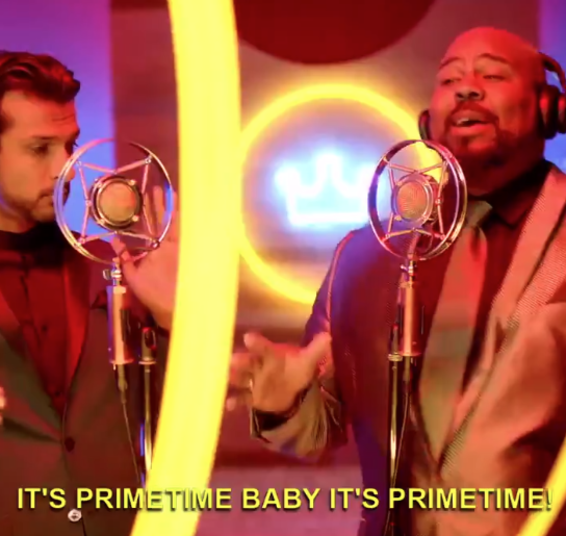 NBA Saturday Primetime on ABC features an original song by Tony Award Winner James Monroe Iglehart (Aladdin, Hamilton) and Utkarsh Ambudkar (Pitch Perfect, The Mindy Project), members of hip-hop improv group Freestyle Love Supreme. Written and performed by Iglehart and Ambudkar, the anthem celebrates the launch of NBA Saturday Primetime on ABC with the biggest storylines and stars on the court. This is the first of a series of spots to be released throughout the season, which highlights each Saturday’s match ups. Tune in to watch the NBA season kick off on January 20th on ABC. The Myrtle microphone is one of Ear Trumpet’s most distinguishable models, with its signature stainless steel ring and 1930’s styling. Although its looks may be retro, the sound is pleasantly modern, best utilized for live vocal performance or single-micing small acoustic ensembles. What results is a warm detailed sound with impeccable feedback rejection that can also translate effortlessly into studio applications. Notable users of Myrtle include a variety of artists such as bluegrass all-stars the Del McCourey Band, Grammy-nominated folk singer-songwriter Brandi Carlile, and American Folk band The Wood Brothers.